My hair is dark brown with burgundy and blonde highlights. I give credit to Janie Ellis for the awesome turnout! I've been trying for the longest to get a cut and color that I love. When I saw you photo I loved everything about the color and cut I want the same. I will be showing this photo to a salon when I go for my consultation this week. Hope she says yes she can do. Thanks for the photo. Everything is so pretty you look great. Katilyn someone is using this photo on Facebook and calling themselves Jami Anderson from Belton, TX. Just thought you should know. Don't know if you would get this message but I thought I'd give you heads up just in case it does send you the comments people post. Your stylist did a perfect job. I agree with previous comment! Either by clever design or accident, your eyes looks astonishing with this style. 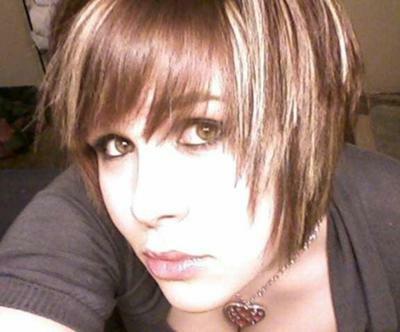 Very cute and edgy haircut and the hair color is perfect match to your eye color. Your hair is so cute! I want mine done like this..its adorable. Join in and write your own blog page! It's easy to do. How? Simply click here to return to Add Your Style.